Salco SP50CR-779 air plier stapler with C-Curved Right anvil. Uses 779 staples. 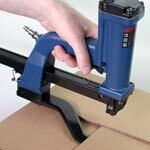 Salco SP50CR-779 pneumatic plier stapler with C-Curved Right anvil for corrugated flaps (for right-handed). Uses 779 series staples, 3/8" - 5/8". Left curved model also available.